When I was young I wanted to hide away. I think almost of all of us did. Yet this weekend we're celebrating trans visibility day. This weekend there are two trans pride events that never existed before. One in Leeds, one here in Edinburgh. This is me holding the loaf of bread I made for Leeds. Queen Jesus' wonderful producer, Annabel Cooper, is taking it there when she goes to introduce the film we made of the performance in St Mark's church in 2005. I'm happy because even though I can't perform the show in Leeds myself this time, I hope one day I will. 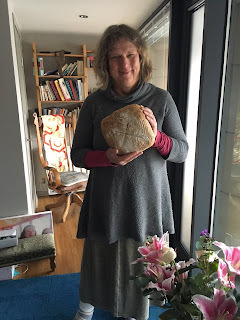 And I love making bread for the show, and even though I can't be in Leeds myself I wanted to send them a physical part of me to accompany the virtual me they'll see in the film.